Ensemble methods represent a relatively new approach to motif discovery that combines the results returned by "third-party" finders with the aim of achieving a better accuracy than that obtained by the single tools. Besides the choice of the external finders, another crucial element for the success of an ensemble method is the particular strategy adopted to combine the finders' results, a.k.a. learning function. 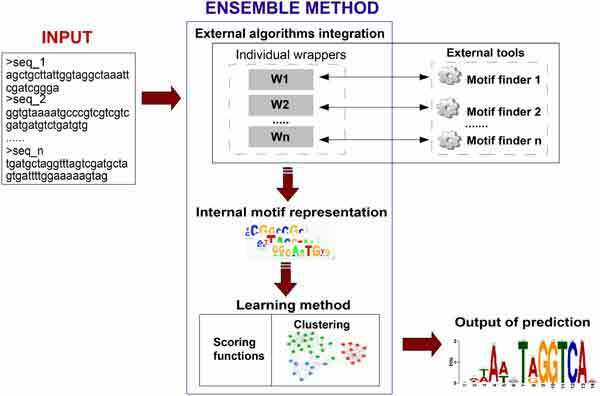 Results appeared in the literature seem to suggest that ensemble methods can provide noticeable improvements over the quality of the most popular tools available for motif discovery. With the goal of better understanding potentials and limitations of ensemble methods, we developed a general software architecture whose major feature is the flexibility with respect to the crucial aspects of ensemble methods mentioned above. The architecture provides facilities for the easy addition of virtually any third-party tool for motif discovery whose code is publicly available, and for the definition of new learning functions. We present a prototype implementation of our architecture, called CE3 (Customizable and Easily Extensible Ensemble). Using CE3, and available ensemble methods, we performed experiments with three well-known datasets. The results presented here are varied. On the one hand, they confirm that ensemble methods cannot be just considered as the universal remedy for "in-silico" motif discovery. On the other hand, we found some encouraging regularities that may help to find a general set up for CE3 (and other ensemble methods as well) able to guarantee substantial improvements over single finders in a systematic way. DNA binding, ensemble methods, motif discovery, software tool, transcription factor, XML. Department of Science and Methods for Engineering, Univ. of Modena and Reggio Emilia, Italy.